DFB CUP FINAL IN 2015! But before the triumphant motorcade and the well-deserved victory celebration took place, fans all around the Olympic Stadium and throughout the city of Berlin were treated to great fun with other Volkswagen events. 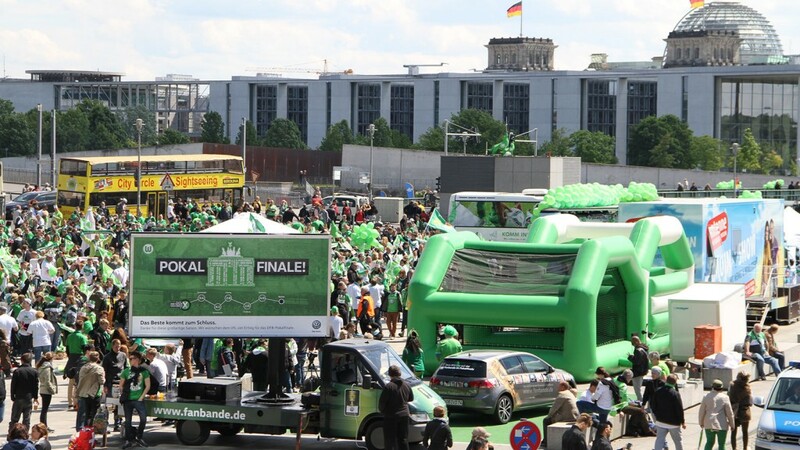 Volkswagen integrated the “Fanbande,” a perimeter advertising board campaign introduced in 2014, into its live communication. 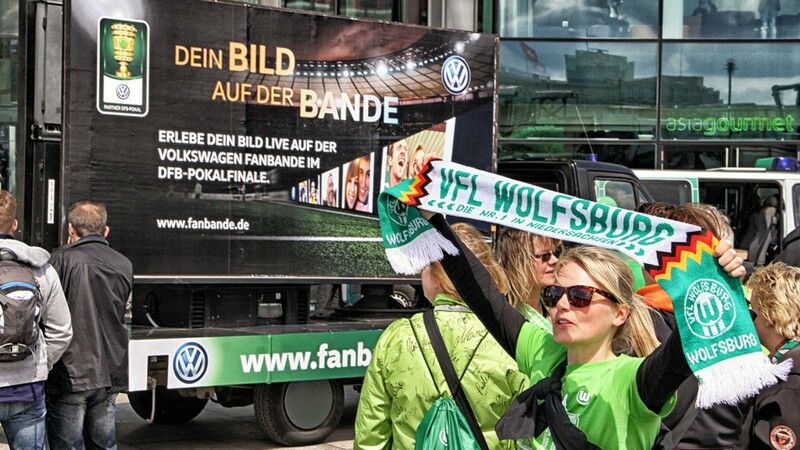 The partnership between the DFB, Volkswagen, VfL Wolfsburg and its fans was to be brought alive with innovative and emotional moments. We used mobile advertising spaces, large-scale projections and live promoters with handheld projectors to publicize the submission of photos. The photos submitted were displayed inside the stadium and on the LED trucks. 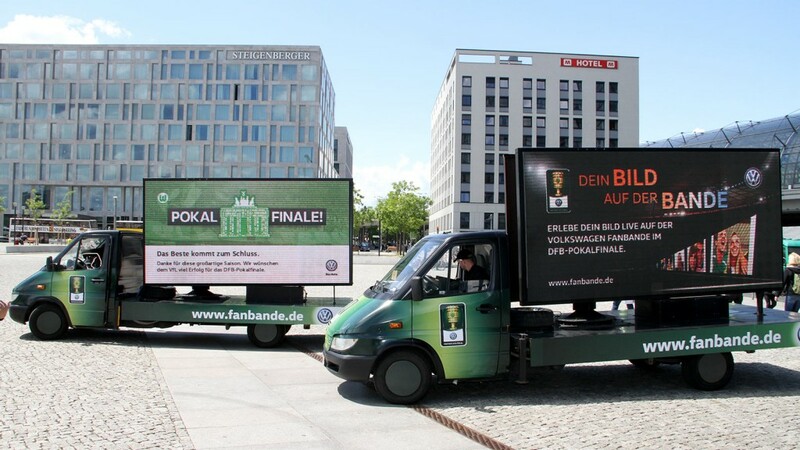 VOLKSWAGEN WINS THE MOTORCADE FOR THE DFB CUP FINAL IN 2015! The duels “VFL Wolfsburg vs. Borussia Dortmund” and “Volkswagen vs. Opel” took place in the Olympic Stadium and on the streets of Berlin. In the end, the winner on all counts was our client Volkswagen. Whereas in 2014 only fans present in the Olympic Stadium were able to post their messages to the electronic perimeter board, this time around Volkswagen gave all soccer fans the possibility to transmit their photos onto the perimeter board inside the stadium as well as on 10 LED trucks in Berlin – before, during and after the game. After the game, we used the trucks to display additional content. In the early morning hours, we transported the LED trucks to Wolfsburg for the motorcade and the victory celebration in the town square. The trucks were used to show exciting scenes from the game, the handover of the trophy in the stadium, victory congratulations and photos of the players with the fans. 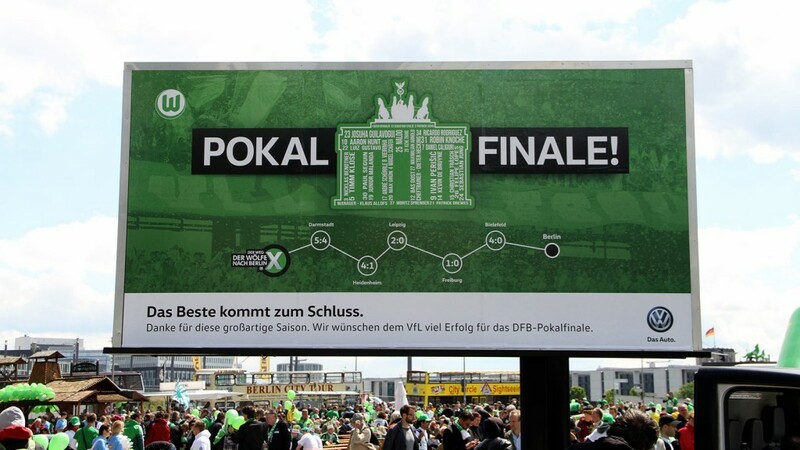 At the end of the day, it was a fantastic campaign and a vibrant demonstration of the tight bond between the club, the city of Wolfsburg and its fans. The thrilling atmosphere of the final is still with us today, and we are grateful to have been there. 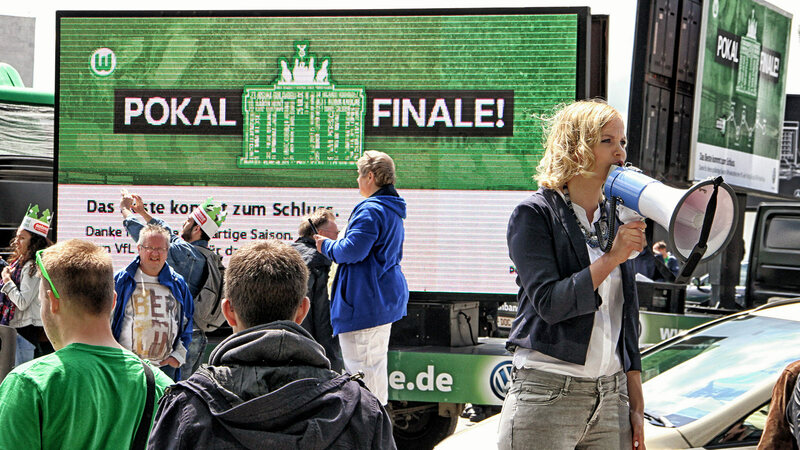 To this end, we secured key high-traffic public spaces in Berlin in the run-up to the game in order to position the VW-branded LED trucks; we also carried out mobile and guerrilla operations to further amplify the campaign message “See your picture live on the VW perimeter board at the DFB finals in the Olympic Stadium.” We used mobile advertising spaces, large-scale projections and live promoters with handheld projectors to publicize the submission of photos. The photos submitted were displayed inside the stadium and on the LED trucks.